I am embarrassed to admit that I found inspiration for this easy crock pot dinner on a website quite a while ago, but I cannot find it again for the life of me. I made a bunch of changes to the original recipe and, despite losing track of my websites, wanted to share my version of the dish here. It came together in a snap, reminded me a little of Mu shu chicken, and both of my kids gobbled it up. Tossing the chicken into the crock pot while it is still frozen makes getting dinner on the table a breeze on the busiest of mornings! Be sure to serve this drippy dish with plenty of napkins. In a medium bowl, mix the barbecue sauce, soy sauce, sesame oil, lemon juice and zest, Orange and Lemon juice and zest, pepper and onions. Place the frozen chicken in the bottom of a slow cooker, then pour the marinade over top. Place the carrots and garlic on top of the chicken. Cover and cook cook on low for up to 8 hours. Remove the chicken from the the slow cooker, discard the skin, and remove the meat from the bones (it will fall off). Use a fork to shred it a little, then put the chicken back into the slow cooker and let it continue simmering for about 15 minutes. Warm the tortillas in a skillet on both sides. 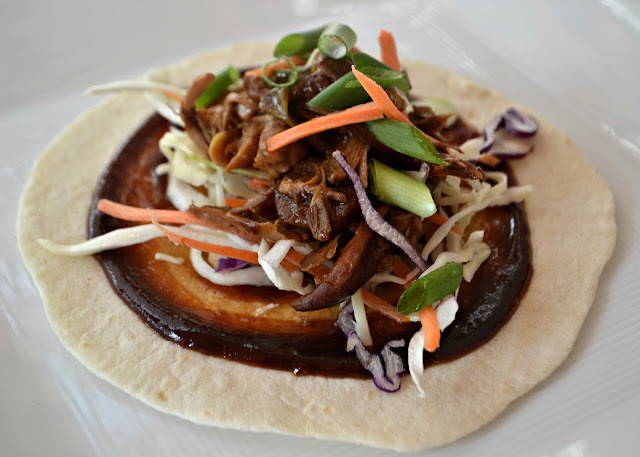 Spread 2t of Hoisin sauce on a tortilla, top with some raw cole slaw mix, shredded chicken, and scallions. Roll up and enjoy!